The developer of “My Movies” for Microsoft Media Center announced on the MissingRemote Forums that a new version of My Movies (3.0) is planned for September. 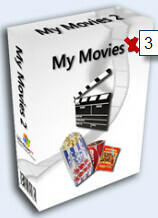 MyMovies 3.0 was written in MCML for Windows Vista and Windows 7. Brian Binnerup the developer of My Movies has posted in the MissingRemote forums that a new version of My Movies will be coming in September and will be the first version that is a native Windows Media center application (written in MCML). Brian sent me a some work in progress screenshots (which I can’t show yet) and it is looking very nice. “This might be as good as any place to mention the specific release plans.